All stations are a go for tonight's Tachi Palace Fights 8. MMA Junkie will stream the event live at 8pm ET. You can reach the live stream page by clicking the TPF 8 image above. 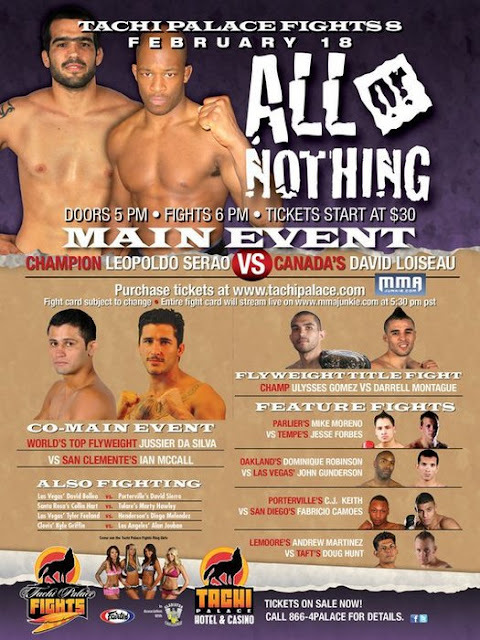 Tachi Palace Fights: "TPF 8: All or Nothing"
Watch Tachi Palace Fights TPF 8 Live Stream Online Results. Lineup finalized for Friday's Tachi Palace Fights 8, MMAjunkie.com streams for free.